This five-ingredient low carb BBQ Chicken Pizza contains less than 9g net carbs for the whole pizza! It has to be tried! Soooo if I didn’t like cooking then I probably wouldn’t have this blog. HowEVER. I really appreciate a short-cut. Or a convenience food – whatever you prefer to call it. Five nights out of seven I’ll cook. Maybe one night we’ll order in. And that leaves the seventh night, when I’m exhausted, lacking in culinary creativity, but so sooo hungry. These latter moments are when you NEED this recipe. 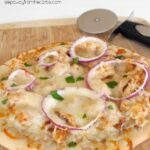 There are many fantastic low carb homemade pizza crust recipes out there – I have one of my own made from cauliflower – but on some occasions, that is just too much work, especially last minute. 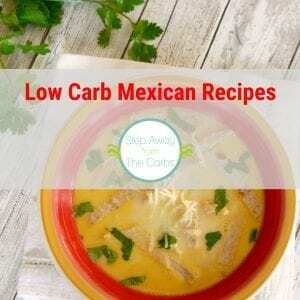 Enter… the Great Low Carb Bread Pizza Crust. 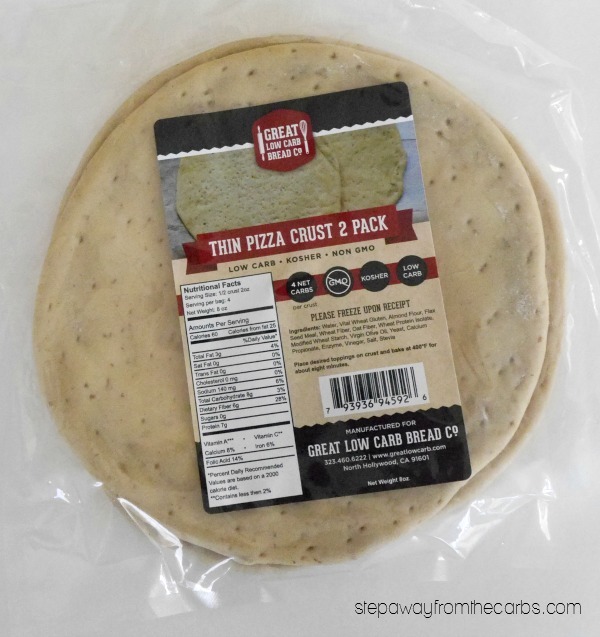 It comes in regular and thin crust varieties – I tried the thin crust which is 2g net carbs per serving (half a 4 oz pizza base). And actually, I’m OK with eating the whole thing for 4g net carbs! 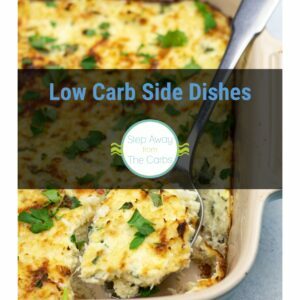 You can cook them straight from the freezer with your choice of toppings, which is SO easy. 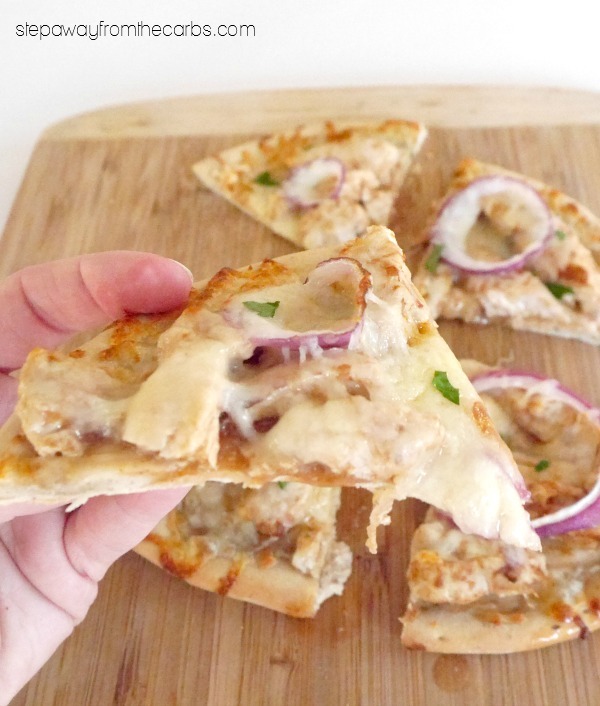 For super quick (and lazy) pizza prep, combine cooked chicken pieces with some BBQ sauce. The chicken could be left over from a whole roast chicken, bought already cooked, or somewhere in between. 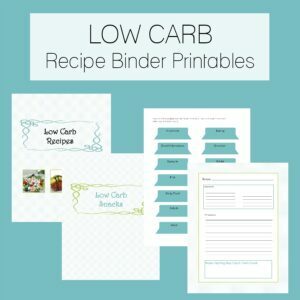 The emphasis on this recipe is CONVENIENCE. Oh, and by eliminating any tomato element we’re saving a ton of carbs. However the BBQ sauce is important. It *must* be low carb and sugar free. 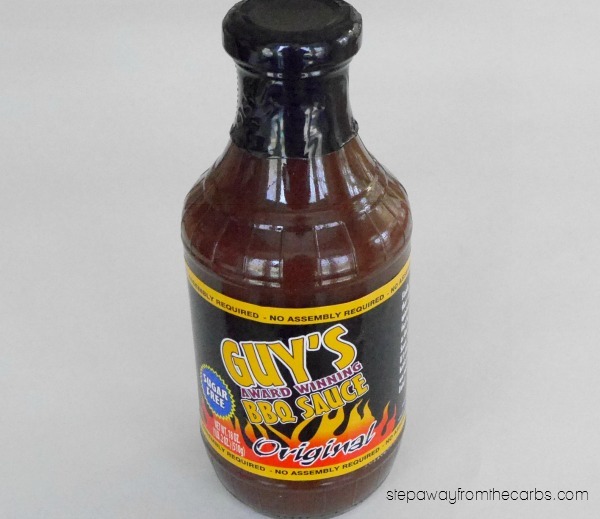 Guy’s Award Winning BBQ Sauce has been my go-to brand for many years, and I love the different varieties, too! 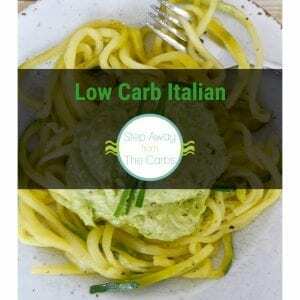 But the original flavor is all we need right now, and at 2g net carbs for two tablespoons, it’s perfect for this recipe! 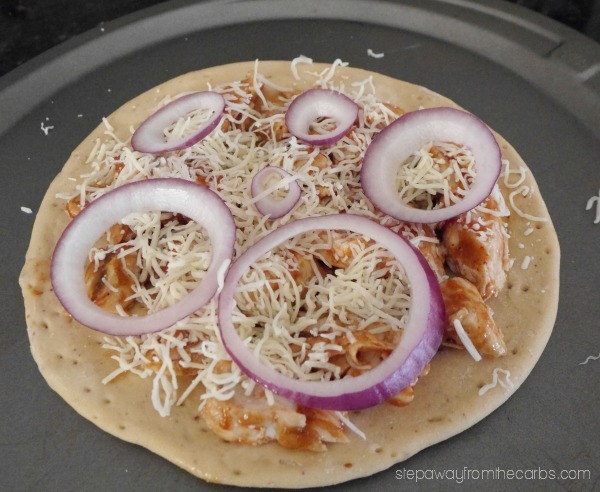 Spread the BBQ chicken mixture onto one of the frozen pizza crusts. Add some shredded cheese over the top (I used an Italian blend) and finish with a few slices of red onion. Actually, after I took the above photo I added some more cheese. Because, well, why not?!? 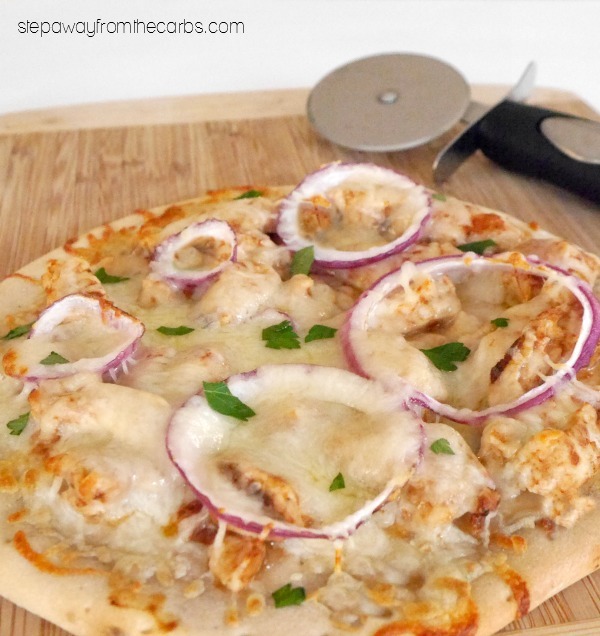 Cook the pizza on a pizza pan in a preheated oven for 8-10 minutes or until cooked through. Sprinkle with chopped fresh flat-leaf parsley and serve. All to yourself. You deserve it! Combine the chicken pieces with the BBQ sauce. Spread it onto the frozen pizza crust. Add the cheese over the top and finish with a few slices of red onion. Cook the pizza on a pizza pan for 10-15 minutes or until cooked through. Sprinkle with chopped fresh flat-leaf parsley and serve.